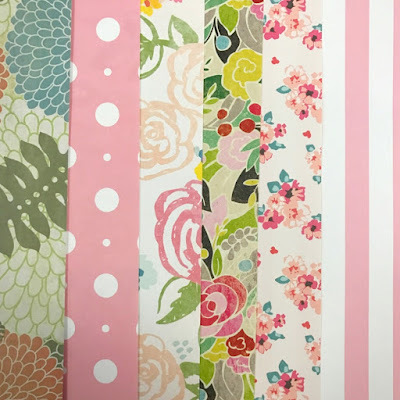 Would you like to learn how to turn ho-hum envelopes into something special? We have a quick DIY tutorial to show you how to create your very own envelope liners. If you love paper, we know you’ll love this tutorial. Pretty paper and special events go together, don’t you agree? You might add liners to coordinate colors of wedding and baby shower invitations, or to dress up holiday cards, announcements, and personal stationery. While liners may seem complicated and expensive, they are actually pretty easy to put together. It’s as simple as adding a piece of paper to an envelope with a few basic steps. The best paper for this is lightweight paper. We don't recommend using rigid cardstock as it is too heavy for a liner and will not crease well. We used standard 12” x 12” scrapbook paper in our example. Now the design of the paper can be anything you like. 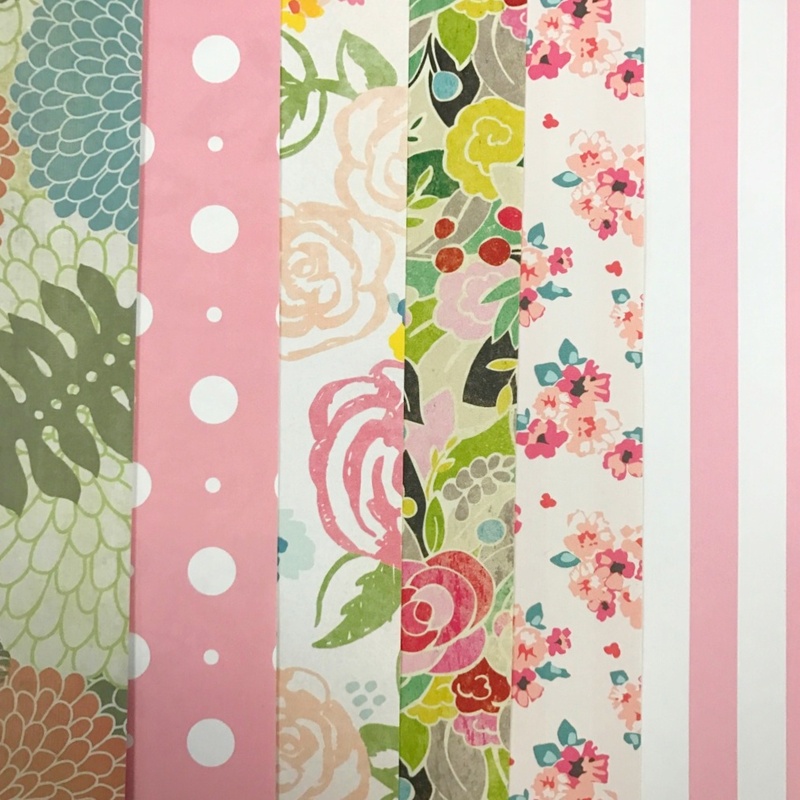 It could be patterned, frosted, floral, or a pop of color. It might even be sheet music, magazine pages, leftover gift wrap, printed words, or a recipe. Wacky or elegant. Choose whatever paper inspires you. Have fun with this one! For this tutorial we used our Premium White envelope in a standard A6 size. However, any size is fine since you are creating your own liner. Flip the design face down so you are tracing onto the side that will be glued inside the envelope. Trace the outside of the envelope with the flap open onto your liner paper. *Pro-tip: Start at the very edge so you can get more than one liner out of the sheet. Sharp scissors are best. Another option is to use an X-acto knife, although it isn’t necessary. If you happen to have one and want to use it, make sure to use a cutting mat to protect your surface. You can use this first cut-out as your template to make as many liners as you need. We’re almost done! Since the liner is the same width as the envelope, it won’t fit inside the envelope without a slight trim. Cut about 2 inches off the bottom and about 1/8” off the sides. Leave the flap as is. Test the fit of the liner, trim more if necessary. Remember, you still to need to seal your envelope after you insert your liner. So, be sure not to cover your envelope adhesive. After you have found the perfect fit, fold the flap to create enough of a crease so that when you open the envelope, this crease is visible. Carefully smooth into position and secure, centering the liner evenly inside your envelope. Glue stick works great. Other options are double-sided tape or spray glue. *Pro-tip: You don’t need to glue the whole piece down. All that’s necessary is to glue the flap. Voila, your very own envelope liners. Your friends won’t be expecting this, but they’ll notice your personal touch and wonder where you got your cute envelopes! Is it the bird’s home up in a tree? What moms do when preparing the home for a new baby? At ClearBags, we think about packaging, of course! Nested packaging, that is. What do we mean by this? We’re so glad you asked. It’s the idea of packing a collection of smaller items inside a larger container. The concept is similar to Matryoshka dolls, also called Russian nesting or stacking dolls. A set of dolls is replicated so that a smaller doll fits inside a larger one until together they form one doll. Often the dolls represent a family or theme. Children’s blocks are arranged this way, too. Children’s blocks are often nested, with a smaller block inside a larger one, or stacked one on top of the other, especially popular for the ABCs. Here stacking is a towering display. Nested or Stacked Packaging works exactly the same way! Simply put, nested packaging is placing one container inside another. Stacked packaging resembles a tower of boxes with a wide base and a narrow top. These types of packaging are popular with food, clothing, gifts, and kits, but really can be used for just about any product. Display different items in the same product category or similar products of different varieties. It makes an impressive presentation and often saves on space. 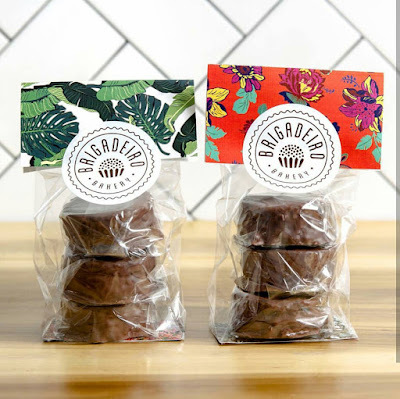 Sometimes, these nested and stacked packaging ideas are intertwined. Here are few examples to show you what we mean. Take a look at this candy tower of jelly beans! Paint a rainbow of color using clear boxes. 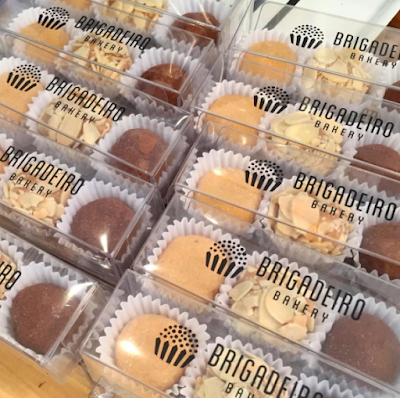 So many choices, so many flavors! Notice how you can clearly see each distinct color. Each box contains the same shape and size of a similar product, yet each one is unique. Instantly, we’re reminded of all the many different varieties of jelly beans. 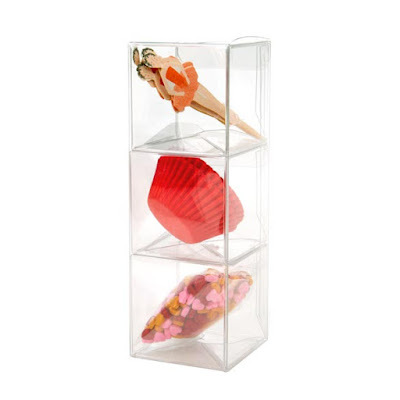 Create this tower by using smaller, identical clear boxes and place them inside a larger outer box. It’s a simple design that goes a long way. We have clear boxes designed to accomplish this feat. 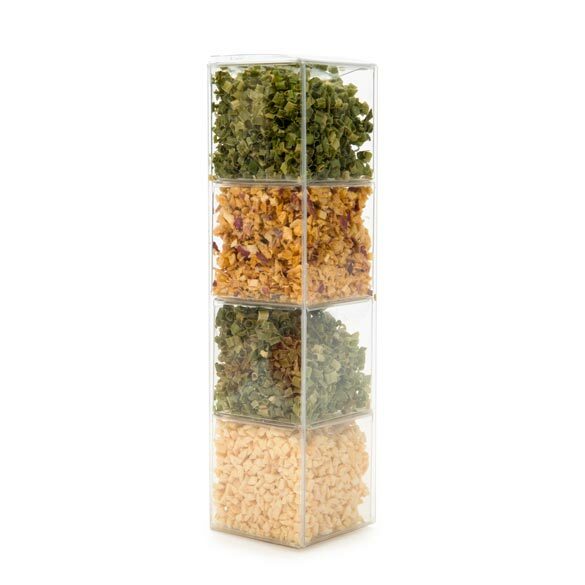 You can make the tower higher by adding small crystal clear boxes in groups of three or six, depending on the size of the outer container. You can also mix and match candies. Try M & M’s, gumballs, and malt balls. The nice thing about this design is that you can display the tower in either a horizontal or vertical direction. 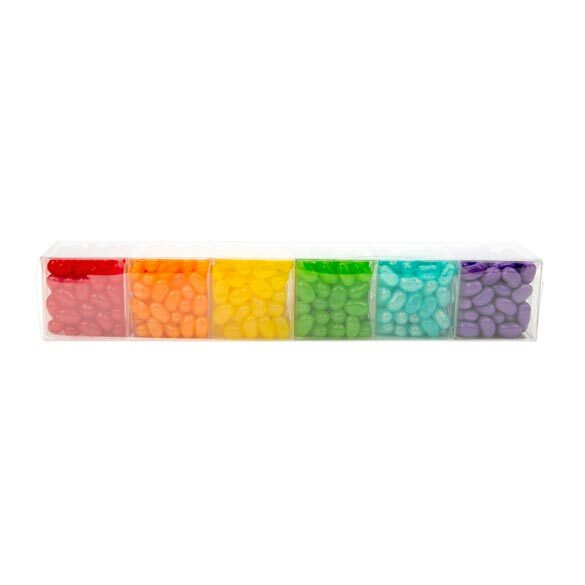 Either way, we want to eat all of these jelly beans! The nested tower isn’t limited to candy. Try packaging spices in these containers. Together they resemble a sort of packaged spice rack. Similar to the candy tower, the individual spaces are packed using smaller transparent boxes. Like the jelly beans, we see how each spice is different but belongs to the same product category. This idea showcases a green and white pattern. Spices can be interchanged with like colors of different or same varieties. Try alternating garlic and chives or sugar and cinnamon or with each box, a new spice or herb. Nested Towers are also a great way to package non-food items like socks, ties, shot glasses, and just about anything else. We have boxes available in multiple sizes. 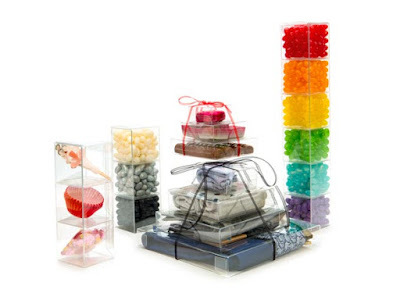 We used our Crystal Clear Pop & Lock Boxes to create these ideas. While the nested towers use identical-sized boxes to create a tower, the towering stack is made from an assortment of different box sizes. Often, each box showcases a different product. This configuration has the widest box on the bottom and the most narrow box placed on top. Like the children’s ABC blocks, these products typically represent a theme or product category. For instance, take this towering stack of candy. Here we have different items that belong to the same category, and that category is candy. Just who can resist a towering stack of candy? You see that there is a different product in each candy box. We have candy bars in the bottom box, followed by truffles, and a pink foil-wrapped candy on top! Look at the different textures and complementing pink accents of the paper wrapped truffles and foil. Unlike the nested towers, this nested stack is displayed in the vertical direction only. You can decide how high you’ll stack them. A colorful ribbon pulls the stack and your presentation together. 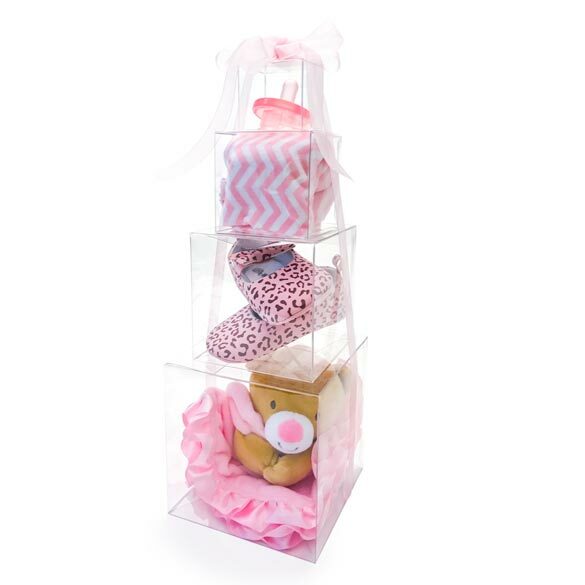 Speaking of ribbons, a towering stack also makes an excellent gift! It’s a simple way to organize a theme package and display an assortment of small items. Take a look at this Father’s Day theme stack. 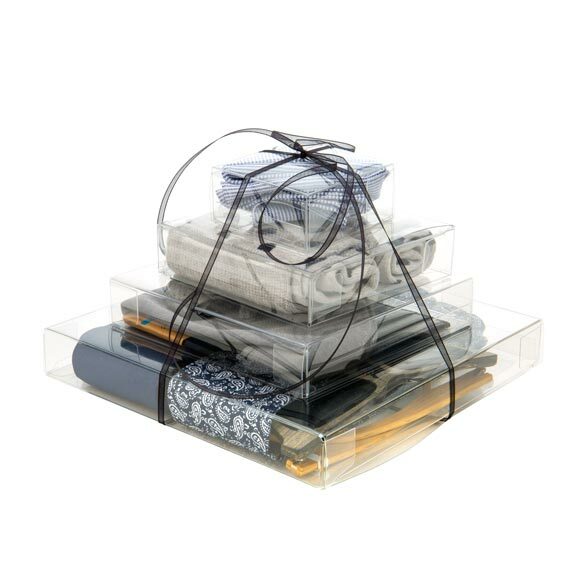 This package includes sunglasses, neckties, wallet, a bow tie, and handkerchiefs arranged in separate compartments. Together, they make a knock-out presentation. 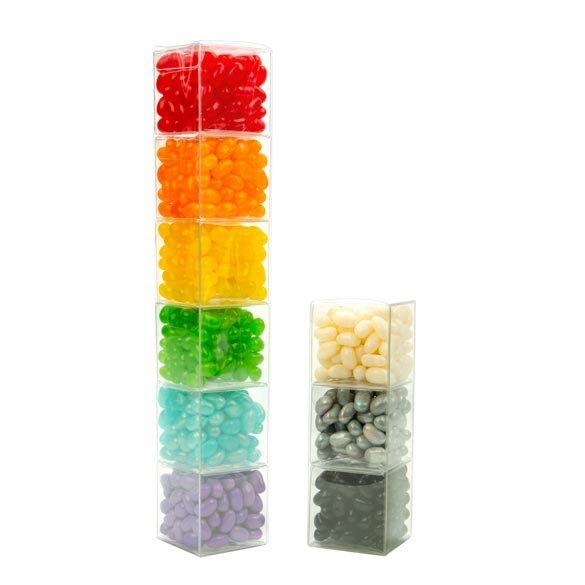 Like the candy stack, this stack has a wide base and works its way up to a narrow top, using smaller boxes of proportionate dimensions. Little gifts can make a big impression, and more boxes mean more to open! And yet, this display is compact and takes up little space on retail shelves. What about a gift for the baby? Welcome the little one with this festive baby shower tower! Create this baby-themed stack using our clear cube boxes. Gather baby’s essentials to create a special gift or centerpiece display. This collection includes a pacifier, blanket, leopard-print shoes and, last but not least, a cozy teddy bear. Highlight matching pink colors, while showcasing a unique, tiny item in each box by stacking cubes of decreasing size. Add a soft flourish with a pink ribbon. 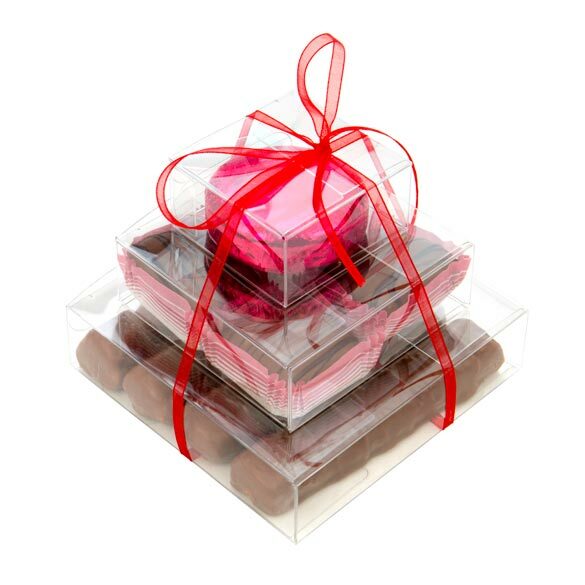 Stacked gifts are perfect for baby showers, weddings, birthdays, or any holiday celebration. Easily accessorize with twine or ribbon. Nested kits are another way to showcase a theme. Similar to a stacked gift, a nested kit is a collection of products, packaged in an efficient way. It is perhaps less random than a stacked, multi-piece gift and designed with a bit more purpose in mind. These items may already exist as separate items on retail shelves, but putting them together can be a time saver for your customers. If want to do it yourself, they are fun to put together. How cute is this mini-cupcake kit with dancer cupcake toppers, liners, and heart sprinkles? This makes a unique gift for valentine’s day or any special occasion. This nested kit uses three identical clear boxes that are placed inside a larger box. Although here we see the same sized boxes, a kit doesn’t need to follow this arrangement. Boxes with varying sizes work just as well. Just remember to use a big enough outer box to hold all your items. The possibilities are limitless. Kits for smores, cookies, gardening, pedicures, quilting are just a few ideas. Think of any hobby or interest, and you have a kit in the making. Small items grouped together make a big idea package. 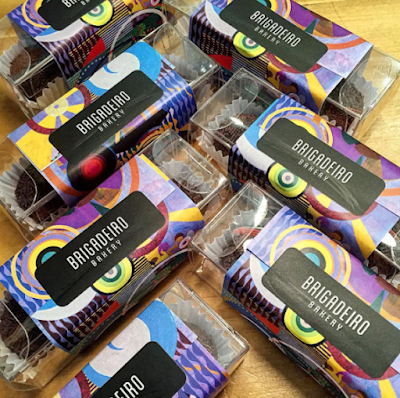 We hope that these ideas have inspired you to give nested and stacked packaging a try! It’s the season of love, and there is nothing that we love more than our customers. 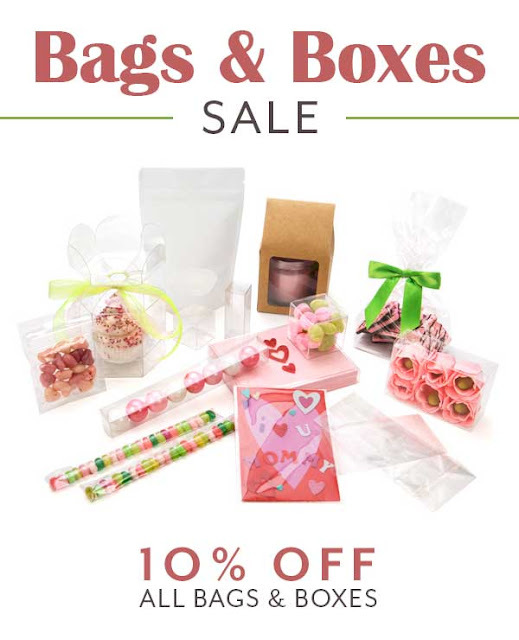 For that reason, our valentine to all of you is our biggest sale of the year – 10% OFF all bags and boxes. You can sign up to get the Valentine’s promo delivered to your inbox here. Executive director of the Pantone Color Institute, Leatrice Eiseman, says the color stands for more than just green. So as you think about your marketing messages, packaging and products this year, you might consider using this fresh shade of green. 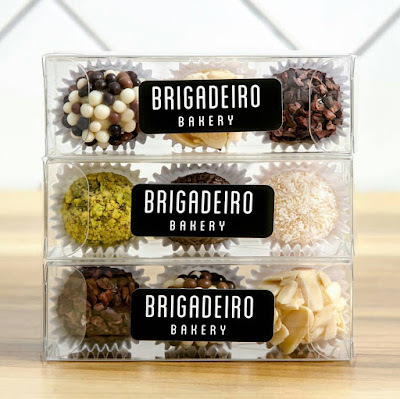 Of course, with clear packaging you can showcase anything, so go out there and find some matching colors to put inside. As a sneak peek, we are working on bringing in a green rice paper pouch that is close to the Greenery color, though not an exact match. Remember, we can do any color of packaging through our custom printing process. Get your promo code by signing up below. 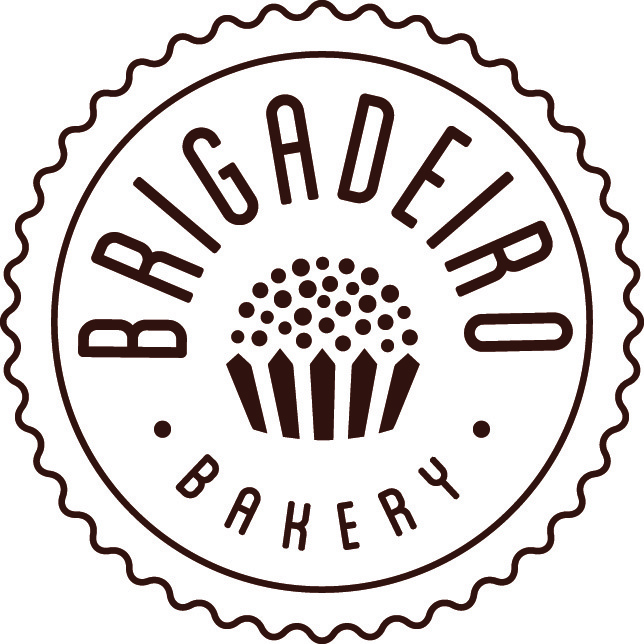 Promotion ends February 28, 2017. Discounts only apply to stock items; they do not apply to clearance or custom products. Promo codes cannot be combined. 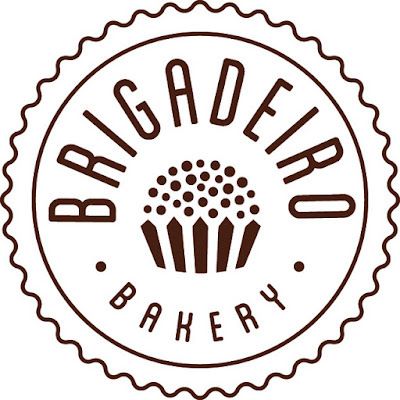 With their soft, airy shell and sweet filling, macarons surpassed the popularity of cupcakes and have become the new “It” dessert. 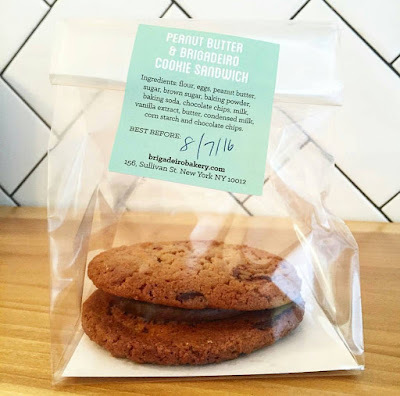 Here are some fresh ways to package these delectable desserts. 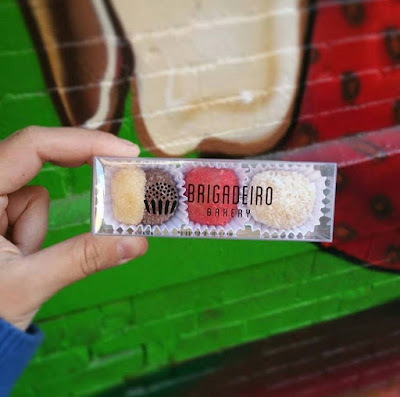 We spoke with Lucía Merino Casablanca about her incredible pastry company and what she uses to package her delicious macarons. By now, you’ve probably packed away your holiday decorations. Maybe you have even broken your New Year’s resolutions. But with last year still fresh in your mind, it’s still a great time to get organized! Discounts only apply to stock items; they do not apply to clearance or custom products. Promo codes cannot be combined.